We felt it impor­tant that we should have a day where all of us as South Africans can come togeth­er and pray for our first demo­c­ra­t­ic pres­i­dent and reflect on his lega­cy. But it is also to pray for our nation … to pray that we not for­get some of the val­ues he fought for … Man­dela dis­tin­guished him­self for good things and good things only. As peo­ple have been pay­ing their trib­utes to Man­dela, many have struck me. Man­dela was born on July 18, 1918, in the Transkei, a region of rolling green hills near the south­ern tip of the African con­ti­nent. In his auto­bi­og­ra­phy, Long Walk to Free­dom, he recalled his child­hood as a sim­ple, joy­ful time. He herd­ed sheep and cows near his mother’s huts and played bare­foot with oth­er boys. He was edu­cat­ed by British mis­sion­ar­ies, got a law degree and even­tu­al­ly opened the first black law firm in Johan­nes­burg. 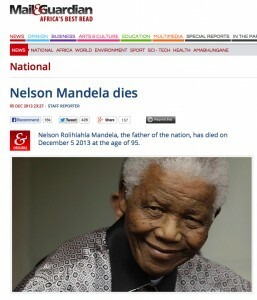 Then there’s the light­ing of an eter­nal flame in his home­town, Qunu, locat­ed in an East­ern Cape province [link]. “His char­ac­ter, his behav­iour, his lead­er­ship, his val­ues and prin­ci­ples. It also says to us that we can­not stop now just because he is gone, but we must con­tin­ue to light the nation, to do things that we have been doing, and strength­en our­selves and moti­vate our­selves,” she said. So many peo­ple have pro­claimed how spe­cial and influ­en­tial Man­dela was to their own lives. But it’s amaz­ing that the list includes entre­pre­neurs such as Bill Gates [link] and Richard Bran­son [link]. I includ­ed some bio­graph­i­cal links in my ear­li­er blog [link] on Man­dela. I do com­mend the Nel­son Man­dela Cen­tre of Mem­o­ry for a quick and graph­ic sum­ma­tion of his life [link]. And while there are many lines from Nel­son Man­dela that I could quote as a close, I offer this, one of my per­son­al favourites: “Edu­ca­tion is the most pow­er­ful weapon which you can use to change the world.” I remain con­fi­dent that Nel­son Man­dela will always be with us.